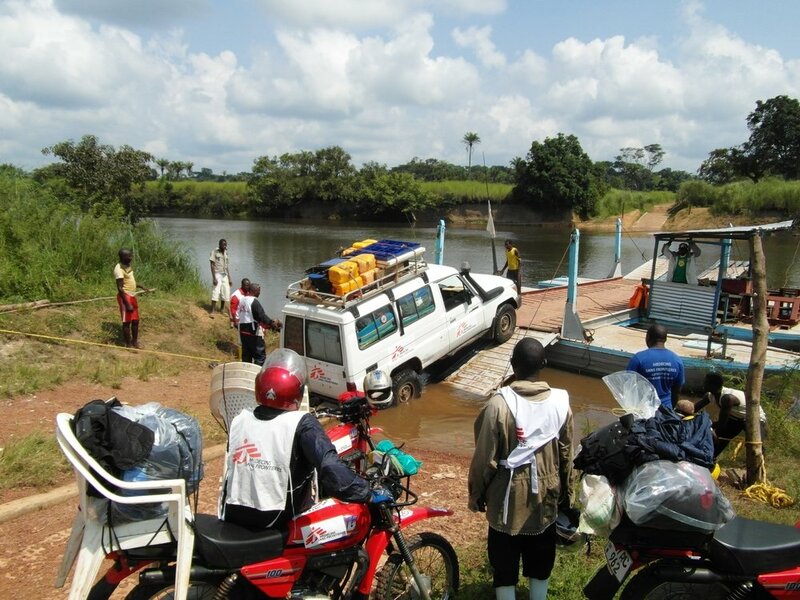 Travelling by jeep and motorbike, a Doctors Without Borders (MSF) mobile medical team is making its way through a remote and insecure region of Democratic Republic of Congo to screen and treat people suffering from sleeping sickness. In a small, dark clinic in the northeastern region of Democratic Republic of Congo (DRC), 24-year-old Germaine lies on a cot, unable to walk because she is so dizzy. She was bitten by a tsetse fly and MSF doctors have diagnosed her with sleeping sickness. Germaine is one of 42,000 people MSF is aiming to test and treat for the tropical disease over an eight-month period. In May 2015, mobile medical teams, made up of doctors, nurses and lab technicians, began travelling through dense and unstable regions of Province Orientale, Ango and Banda Territory, near the border with Central African Republic, visiting villages where disease rates have been historically high. “We are making a big effort to reach people who live beyond the villages,” said Rolland Kaya, MSF’s head of mission for sleeping sickness. “We are focusing on the most vulnerable and hard- to-reach groups of people, such as refugees and nomads living in the bush. A team of public health sensitisers travels to remote farming and fishing communities to let them know we are in the area. Since May, MSF has screened 12,183 people, 91 of whom have so far been diagnosed with sleeping sickness. With the team working in such remote areas, MSF is also taking the opportunity to provide people with general healthcare, particularly pregnant women, children under five and adults with malaria symptoms. Since May, the team has treated 6,884 people for malaria. Early symptoms of sleeping sickness include fever, headaches, joint pain and itching. The drugs used to treat people in the early stages of the disease are relatively easy to administer and non-toxic. The earlier the disease is identified, the better chance there is of a cure. In the second stage, parasites cross the blood-brain barrier and infect the central nervous system. This is when more obvious signs of the disease appear, including a disturbed sleep cycle, which gives sleeping sickness its name. Germaine began showing symptoms of sleeping sickness three months ago, after the birth of her third child. Germaine will spend seven days in the clinic to receive injections of the drug pentamadine. Sleeping sickness continues to affect millions of people in 36 countries in sub-Saharan Africa. Most live in remote, rural areas with limited access to health services. Many have been displaced from their homes by war and poverty. These factors all make it difficult to carry out surveillance, and to diagnose and treat cases. However, in the past decade, the number of sleeping sickness cases around the world has dropped, and treatments have improved. MSF has been actively engaged in treating sleeping sickness for 25 years in DRC, Central African Republic, Republic of Congo and South Sudan. MSF teams say they have noticed people in DRC becoming more aware of the dangers of the disease, while behavioural changes, linked to insecurity, are also contributing to the fall in cases. “We believe the decrease in the number of cases we are seeing is linked to people beginning to change their lifestyles due to the insecurity in the area,” says MSF health advisor Dr Turid Piening. But to eliminate the disease, much more remains to be done, including the development of an easy-to-use rapid test to replace complicated diagnostic procedures, coupled with oral drugs that can be taken at home. Until that happens, MSF is committed to finding, testing and treating people suffering from this life-threatening disease, however remote the area in which they live. Find out more about MSF's work in Democratic Republic of Congo.